The constant scrutiny of each and every corporate decision Apple makes may provide us a little insight into the day-to-day activities of Tim Cook’s company, but what it doesn’t do is provide us with a rationale behind some of the decisions made. And Apple’s decision to attempt to block the use of unauthorized Lighting cables within iOS 7 is one of those decisions that some consumers would like some more information on. There’s been plenty of horror stories about the public receiving nasty electrical shocks and devices catching fire through the use of cables supplied outside of Apple’s control. Some may feel that we have two perfectly good reasons right there why the company would like to prevent users from purchasing those cables, opting for an official purchase from Apple instead. The use of an unauthorized cable prompts the iOS 7 device to throw up a message that says “This cable or accessory is not certified and may not work reliably with the iPhone“, resulting in the device not charging. 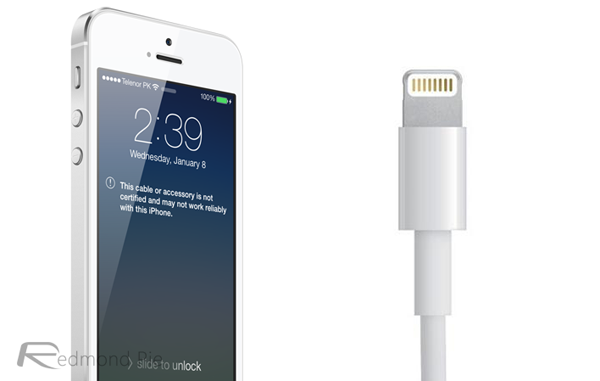 Is this a clever ruse by Apple to sell more Lightning cables? Or is it a reaction to a genuine concern? Regardless of which it turns out to be, it can prove to be an annoyance. Thankfully the jailbreak community has stepped in with a simple one-install solution that will eradicate the alert and lets the user use any unofficial Lightning cable for charging without any fuss. Follow the simple instructions below to add the required repository to Cydia and grab the package right away. Step 1: Launch Cydia and allow all packages and repositories to refresh. Select Manage from the bottom tab bar. Step 2: Select Sources from the middle of the list. Select Edit from the top right corner. Step 3: Select Add from the top left corner. A new dialogue box will appear asking for the URL of the repository to add. Step 5: Select Add Source and wait for packages to refresh. Click on the newly added repository to view the packages. Step 6: Select and install the Unauthorized Lightning Cable Enabler package. The installation of this package will now allow you to use any Lightning cable with your device for charging. Thanks, Cohen for sending this in! Update x1: After a brief run with this package installed on our iPhone we noticed that iOS 7 still showed us a warning, but the cable kept on charging. Your mileage with this tweak may vary, depending on the iOS device and manufacturer of the Lightning cable in use. What doe it mean when it says “our mileage with this tweak may vary, depending on the iOS device and manufacturer of the Lightning cable in use.”?